Aims: The aim of this study was to assess the perspectives of the female nurses regarding the prevention and treatment of low back pain (LBP). Materials and Methods: This cross-sectional study was conducted on 222 female nurses working in Borujen Hospital (situated in Chaharmahal and Bakhtiari Province of Iran) in 2015 selected using simple random sampling. The data were collected using a self-designed questionnaire consisting of 29 items designed in terms of personal information, self-care, awareness, and prevention of LBP. The validity and reliability of this questionnaire was confirmed. Results: About 93.7% of the participants of this study suffered from LBP with a majority of them (21.6%) reporting the monthly episodes of LBP. In terms of actions taken by the nurses when experiencing LBP, it was found that 58.1% of them used to rest during the LBP episodes while 36.5% of them preferred to seek care from a physician, especially a general practitioner. In general, the best-reported ways to ease the LBP were as follows: resting (80.2%), going to doctor (32.4%), and physical exercises (32%), especially practice of back-strengthening exercises. Nearly 53.2% of the nurses proposed that when experiencing LBP, the analgesics should be taken while 44.6% and 1.4% of them believed the nonsteroidal anti-inflammatory drugs and muscle relaxants or drugs can be helpful, respectively. Conclusion: It is very important for the nursing personnel to equip themselves with some information regarding how to manage LBP properly as well as its respective preventive measures so that they can create a healthy work environment for themselves. Low back pain (LBP) is one of the most common and costly musculoskeletal problems in modern society that most of the people experience at least one bout of lower back pain in their lives. Almost 84% of the world population would experience LBP at some point in their lives. LBP is known as the first cause of disability in the individuals <45 years old, the second reason for seeking care from a physician, and the third leading cause of surgeries. LBP is considered as one of the serious, costly, and highly prevalent health problems among the nurses. In Ramezani Badr's study (2006), the rate of absence from work due to LBP was 10.3 days a year. In the literature, the reported prevalence of LBP among the nursing personnel has been up to 56%–90%. Furthermore, as per the findings of the research in this field, the LBP is much more frequent among the female nurses compared to the male ones. In Iranian population, based on a cross-sectional study, a prevalence of chronic LBP of more than 27% has been reported. LBP is a multifactorial phenomenon. The insufficient resting time, highly busy and stressful workplace, anxiety, and depression are among the most important preconditions resulting in LBP. LBP may result in some problems including different degrees of disability, decreased daily activity, physical, emotional, and work-related problems, and finally, direct and indirect costs, all of which indicate the necessity for giving due consideration to this health problem. Literature review indicated that age, gender, height, weight, smoking, physical activity, marital status as well as type of occupation have been enumerated as the personal risk factors associated with LBP. Overweight or obesity, smoking, poor fitness, muscle weakness, psychological factors, and deficiency of some types of vitamins and nutrients such as Vitamin D are among some known manageable and modifiable risk factors causing LBP. In addition, heavy physical activity, permanent or prolonged standing, recurrent bending and twisting, lifting the heavy objects as well as psychological-social factors are a number of main work-related risk factors reported for LBP. It is noteworthy that the nurses themselves must take care of their health through prevention and take the appropriate measures for their treatment when suffering from a disease. As a result, if the health problems of the nurses are not recognized, no interventional plan can be helpful. Since the majority of the studies on the LBP in the nurses are mainly focused on the risk factors for LBP or interventions appropriate for decreasing its rate and a limited number of the studies have been devoted to the assessment of the nurses' viewpoints regarding prevention and self-care, the present study selected to explore the perspectives of the female nurses working in the Borujen Hospital of Shahrekord, Iran, regarding LBP prevention and self-care. This cross-sectional study was conducted on the female nurses working in the Borujen Hospital of Chaharmahal and Bakhtiari Province in Iran in 2015. To do so, 222 participants were selected from among the nursing personnel using simple random sampling and from all the wards of the hospital. The sample size was calculated with confidence level 95% and accuracy d = 2.5. The purpose of the study, which included their rights as human subjects for a research study, was explained to participants, and all signed consent forms. The inclusion criteria in the research were at least 1 year of job experiences and willingness to participate in this research. The data collection instrument was a Persian self-designed questionnaire of 29 items divided into two subsections, i.e., first section devoted to the personal information of the participants (including age, marital status, work experience as well as the ward in which they were working) and second section designed to gather the necessary information on the history of LBP disease, its duration and its associated side-effects and complications, previous self-care, awareness of its reasons, LBP-specific prevention and treatment methods that unwillingness to cooperation, and incomplete and inconsistent responses to the questionnaire were considered as the criteria for exclusion from the study. This questionnaire was compiled using the valid related resources and articles  as well as by pooling the ideas of the nurses and orthopedic physicians. Its validity was obtained after obtaining the views of experts, which was mostly regarding the wording and phrasing of questions, and was used to revise and modify the instrument. Given the type of the items, to determine the reliability of the questionnaire, test–retest was carried out after 2 weeks. As per the Pearson correlation test, the degree of correlation for the items was found to be 0.76 confirming the reliability of the questionnaire. After obtaining permission from hospital manager, questionnaires were given to nurses and they completed the questionnaire during work hours. Once the questionnaire was completed by the participants using self-report method, the collected data were analyzed using SPSS version 15.0 (SPSS Inc., Chicago, IL) and descriptive statistics so as to calculate the measures of central tendency and distribution as well as analytical statistics including Chi-square test to allow the estimation of the association between the data. The mean age of the participants of the study, i.e., female nurses was 32.74 ± 6.77 with the minimum and maximum age being 21 and 51 years old, respectively. Among the participants, 40.5% of the nurses (i.e., 90 participants) belonged to the age group of 30–39 years old. The majority of the nurses (82.4%) were married. Almost 56.3% of the nurses had a working experience of less than 9 years. Most of the participants (25.7%, n = 57) were working in the surgery room while 18.1% (n = 41) and 14% (n = 31) were working in the internal and emergency wards, respectively. It was also found that LBP affected 93.7% of the participants. As for the frequency of LBP episodes experienced by these participants during the last year, the following results were obtained: 21.6% at least once every month, 16.2% once a week, and 19.8% every day. 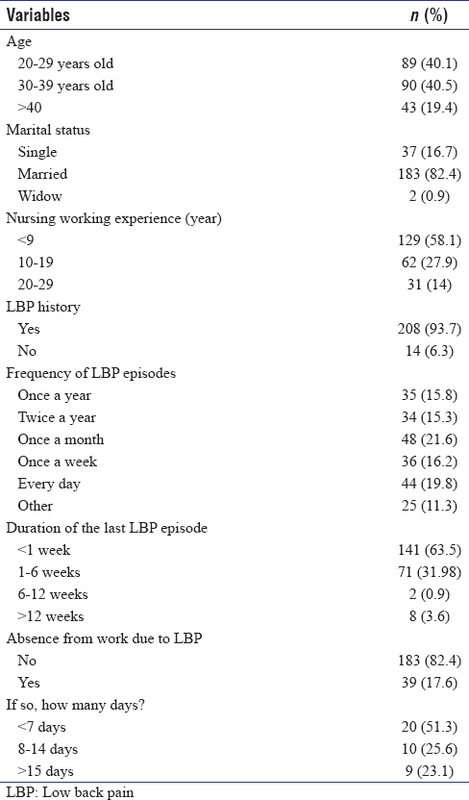 The majority of them (63.5%) reported that their most recent LBP episode had lasted more than one week with a resultant absence from work of 17.6%. From this rate, 45.2% had been forced to take a leave from work for <1 week [Table 1]. As per Chi-square test, there was a statistically significant association between the age groups and absence from work in the nursing personnel (P = 0.003). In this way, absence from work was lower for the nurses in the age group of <30 years old. However, no statistically significant association was observed between the nurses' ward setting and their working experience (P > 0.05). 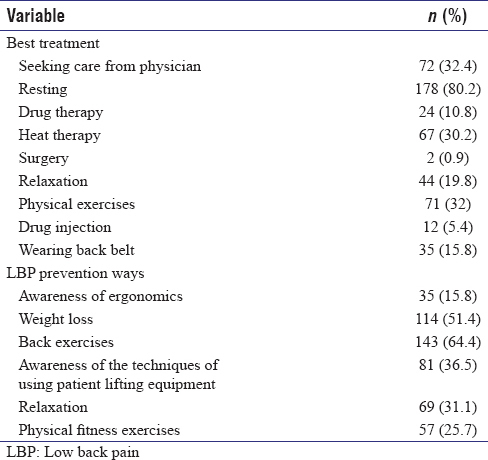 Regarding the measures taken by the nurses during LBP episodes, it was revealed that more than half of the participants (58.1%) selected resting while 36.5% used to seek medical care from a physician. Furthermore, 30.2% of the participants reported the continuation of their normal activities during LBP. As for the medical professionals seen by the nurses for easing their LBP, the following results were obtained: 64.4% visited a general practitioner, 26.1% visited an orthopedic physician, and 14.4% visited physical therapists and nurses. The majority of the participants (72.1%, n = 160) declared that they had already received some preliminary information or instructions on the prevention of LBP. With respect to the informational resources reported by the participants, the obtained results in terms of priority were as follows: mass media (43.7%, n = 97), physicians (33.8%, n = 75), in-service training (9%, n = 20), and finally, physiotherapy department (8.1%, n = 18). As far as the participants' awareness of the LBP disease was concerned, 63.5% of the participants (n = 141) believed that the first experience of acute LBP was typically between the ages of 30 and 40. As for the most common causes of the LBP reported by the participants, the following results were obtained: mental stress (n = 102), weak body posture (n = 100), and lumbar strain or sprain (n = 82). Similarly, work environment (n = 181), physical factors (n = 144), and patient care-related factors (n = 100) were some other main causes enumerated by the participants. The nurses (77.9%) believed that the prolonged standing is the most important physical factor leading to LBP disorder. According to the participants of this study, forward-bending (63.1%) ranked first in leading to LBP among other types of motions. Lifting the objects without getting help (54.1%), lifting the heavy patients (49.5%), and repositioning the patient across the bed (45.9%) were the leading causes of LBP. In the same vein, both obesity (73.4%) and age (51.4%) and both fatigue (74.3%) and anxiety (47.7%) were reported as the most significant social and mental factors contributing to LBP, respectively. Meanwhile, 3.2% of the participants held that mental factors play no part in LBP. Among the workplace-related factors associated with LBP, workload (64.9%), working shifts (62.6%), work functions (54.1%), and work environment and situation (30.6%) in order were reported by the participants in this study. As for choosing the best urgent treatment for LBP episodes, most of the participants under study indicated resting as the best treatment [Table 2]. In the same vein, 63.1% of the participants argued that muscles strengthening exercises especially the back-specific exercises must be integrated into the medical plan chosen for LBP disease. In terms of the required resting time for a LBP episode, 37.8% of the participants (n = 84) felt that they needed resting as long as the pain persists while 22.5% (n = 50) regarded resting for 2–3 days as sufficient. Regarding the red flags after experiencing a LBP episode, 58.1% of the participants believed that when the pain does not respond to treatments such as resting or medication, the patient should seek medical care from physicians. The mediations enumerated by the nurses for alleviating the LBP were analgesics (53.2%) followed by the nonsteroidal anti-inflammatory drugs (NSAIDs) (44.6%) and muscular relaxants drugs (1.4%). Finally, low back-specific exercises were mentioned as an effective preventive measure by the majority of the participants (64.4%) [Table 2]. From among 222 nurses in question, 208 participants had experienced LBP episodes in the past. The estimated rate of LBP prevalence among the Swiss and Nigerian nurses is 73% and 73.53%, respectively., This high prevalence of LBP in the nursing personnel can be attributed to their high workload. About 20% of the nurses taking part in this study reported that they almost experience LBP every day. This finding reveals that the nurses are highly susceptible to LBP risk and this problem can result in their absence from work. More than half of the participants in this study reported that they used to rest during LBP episodes in the past while one-third of them declared that they used to go to a general physician. In addition, one-third of the participants confirmed that they used to continue their routine activities during LBP. In Mounce study (2002), it was found that most of the participants preferred resting with only 10% reporting consulting a general physician. In June study, only 18.3% had received a medical treatment for their LBP. Rejecting resting in bed, the National Institute of Arthritis and Musculoskeletal and Skin Diseases recommends gradual return to normal activities. The informational resources reported in this study were mainly the mass media, physician, and to a lower degree, in-service trainings, and physiotherapy center. In his study, Chubineh found that academic studies were the most common resource through which the nurses obtained the necessary information on the risk factors of LBP. It is generally argued that providing information regarding LBP may be very helpful so that an increased level of information may assist lowering the sickness leaves. Considering the awareness of the prevalence age of LBP, most of this study population believed that the first experience of LBP usually occurs between the ages of 30 and 40. Croft in his study provided some evidence on an increase of LBP with an increase in the age. Mental stress, weak posture, and strain (sprain) were found to be the most common causes of LBP in his study. Cilliers (2013) has reported the sprain of the lumbar soft tissue; impact and weakening diseases are among the most causes of LBP. According to the National Institute of Arthritis and Musculoskeletal and Skin Diseases, the leading reason of LBP is the spasm and contraction of the muscles which may have root in the psychological conditions. Mounca has pointed out that the psychological diseases cause the patient to be more aware of physical sensations such as pain, and as such, the symptoms persist for a longer period. As a result, recognition of these issues may be effective in managing LBP and controlling its frequency. In this study, the prolonged standing was identified as the most significant physical condition contributing to LBP arguing that forward-bending leads to LBP more than other motions. Similar to these findings, Abdinejad study revealed that working in a stooping position is the most important factor in LBP. The range of sharp bending and stretching is among the risky motions associated with LBP. As per Cilliers's study, the incorrect posture of the nurse such as half-sitting or forward-bending when performing the nursing tasks including assisting the patient in bathing are some reasons of LBP. In this study, lifting the objects and lifting and repositioning the patient were reported as the most important causes of LBP. Eriksen et al. reported the recurrent repositioning of the patients in the bed as a predictor for LBP. June and Cho in their study found that the prevalence of LBP was higher among the nurses with 2–4 years of working experience in the intensive care unit than the nurses working in other wards. According to the findings, lifting and transferring the patients and repositioning the patients' bed are the main causes of higher rate of LBP among the nurses. It is argued that the highest pressure is applied on the nurse's back when he/she is transferring the patient to his/her bed, wheelchair, or toilet. Dragging and twisting the patients across the bed can also exert an excess burden on the upper back of the person resulting in the LBP. In 98% of the cases, the nurses move the patients in such a way that inadvertently may put too much pressure on their lumbar spine. Furthermore, changing and arranging the sheet of the patients' beds is accompanied by LBP risk due to the recurrent bending and stretching of the back. Besides, in some other studies, the incorrect body posture, half-sitting position, prolonged standing, and the low nurse-to-patient ratio, i.e., the scarcity of the nursing personnel have been identified as meaningful risk factors for LBP., Handling the patients without help and lack of muscle workouts are other LBP-related risk factors. In addition, Engkvist concluded that the nurses' LBP can be attributed to the lack of proper equipment for the transfer of the patient, sudden motions, and inappropriate workplace. Similar to the present study, the participants in the Cilliers's study believed that LBP is associated with obesity and age  with anxiety and fatigue as the most important psychological factor of LBP. In Smedley study, it was found that there was a statistically significant association between negative mood, stress and job dissatisfaction, and complaints about LBP, a finding which can be a red flag for those who regard the psychological factors as insignificant. Instead of making an effort to eliminate the background cause of LBP associated with the psychological conditions, these people only focus on the medical treatment for their LBP. In this study, the most important risk factor associated with the LBP was workload with work shifts and job tasks being as its major subfactors. Accordingly, the hospital management must try his/her best to lower the environment-related risk factors, and as a result, the LBP prevalence and medical leaves of absence by proper organization of the work shifts of the nurses considering their workload. In terms of the best urgent treatment for LBP, the majority of the nurses selected resting asserting that the resting must be continued as long as the pain persists. Moreover, a very low number of the participants regarded the surgery, drug administration, and wearing a medical back belt helpful for managing the pain. In the same vein, Jellema et al. have proposed that surgery, drug injection, strain methods as well as wearing a back belt are the effective methods for treating the LBP. As for wearing a belt, the National Institute of Arthritis and Musculoskeletal and Skin Diseases has warned that using a back belt may worsen the LBP. It was also found that the only reason for resting for more than 4 days is the pain extending to the legs. The participants in the present study believed that back exercises can be helpful for prevention of LBP. In addition, weight reduction and learning how to use the assistive handling equipment such as pulleys and lifters can be very effective. In this study, the most important LBP-related red flag is when the pain does not respond treatment by resting or drug. As Cilliers argues, the most important red flag symptoms of LBP are urinary abnormalities and muscle weakness. These findings validate that the nurses taking part in this study are not fully knowledgeable about this disease. Most of the participants recommended that the exercises specifically designed for the low back muscles must be put into the treatment plan for LBP. Besides lowering the stress and depression, regular exercise in the working plan of the nurses will be helpful for their muscles fitness and strength effective in preventing or lowering the LBP. The participants also believed that the analgesics and NSAIDs are the drugs which can be taken during LBP episodes. The results of Cilliers study  confirmed the knowledge of the participants regarding the medication therapy for LBP. The nurses in the present study also regarded the back exercises as an effective way to prevent LBP. Furthermore, weight reduction and training on how to use the patient lifting equipment such as rollers can lower the LBP. One limitation of the current study is cross-sectional and thus gives a weak level of evidence of the association between the measured variables. In addition, self-report data were used for this study. The prevalence of LBP in the current study is 93.7%. The majority of participants experienced LBP at least once a month. Sixty-four percent of the nurses reported that their most recent LBP episode had lasted more than one week. The participants could identify the most important physical risk factors associated with the development of LBP. Action taken after the development of LBP included bed rest as well as seeking care from physician and physical exercises. Physical cares are one of the most important factors which must be taken into account by the nurses. It is very important that the nurses be aware of the LBP-related risk factors, preventive factors as well as the proper methods of treating. Observing the proper mechanics of patient care including lifting, pulling, pushing, and handling of the patients and objects may be helpful for decreasing the LBP. It is also proposed that considering the nursing personnel's capabilities, the authorities pay due attention to the selection of the proper equipment required in terms of creating a safe and healthy work environment for them by providing standard conditions (mental conditions, noise, light, temperature, and appropriate workload) so as to lower the workplace-related anxieties. To prevent the LBP in the nurses and proper coping with this disease, it is also recommended that some training courses on observing the agronomical principles and proper body mechanics be planned and implemented. We would like to express our deep and sincere gratitude to the nursing personnel of the Borujen Hospital of Shahrekord and all those who assisted us in conducting and completing this research in any way. Richardson SM, Hoyland JA. Stem cell regeneration of degenerated intervertebral discs: Current status. Curr Pain Headache Rep 2008;12:83-8.
van Tulder M, Koes B, Bombardier C. Low back pain. Best Pract Res Clin Rheumatol 2002;16:761-75. Violante FS, Fiori M, Fiorentini C, Risi A, Garagnani G, Bonfiglioli R, et al. Associations of psychosocial and individual factors with three different categories of back disorder among nursing staff. J Occup Health 2004;46:100-8. Ramazani Badr F, Nikbakht A, Mohammadpour A. Low-back pain prevalence and its risk factors in nurses. Iran J Nurs Res 2006;1:37-42. Levy BS, Wegman DH. Occupational Health: Recognizing and Preventing Work Related Disease and Injury, Selected Groups of Workers. 4th ed. Philadelphia: Lippincott Williams & Wilkins; 2000. p. 770-1. Chobinh A, Pour Kazerooni MB, Tabatabaei HR, Kamali Nia M. Awareness of nurses working in hospitals affiliated to Shiraz University of Medical Sciences of the risk factors for low back pain. J Occup Saf Health 2013;3:55-62. Noormohammadpour P, Mansournia MA, Koohpayehzadeh J, Asgari F, Rostami M, Rafei A, et al. Prevalence of chronic neck pain, low back pain, and knee pain and their related factors in community-dwelling adults in Iran: A Population-based national study. Clin J Pain 2017;33:181-7. Grotle M, Brox JI, Veierød MB, Glomsrød B, Lønn JH, Vøllestad NK, et al. Clinical course and prognostic factors in acute low back pain: Patients consulting primary care for the first time. Spine (Phila Pa 1976) 2005;30:976-82. Trinkoff AM, Lipscomb JA, Geiger-Brown J, Storr CL, Brady BA. Perceived physical demands and reported musculoskeletal problems in registered nurses. Am J Prev Med 2003;24:270-5. Heath KM, Elovic EP. Vitamin D deficiency: Implications in the rehabilitation setting. Am J Phys Med Rehabil 2006;85:916-23. Bernard B. Musculoskeletal Disorders and Workplace Factors: A Critical Review of Epidemiologic Evidence for Work-Related Musculoskeletal Disorders of the Neck, Upper Extremity, and Low Back. Cincinnati, OH: U.S. Department of Health and Human Services, Centers for Disease Control and Prevention, National Institute for Occupational Safety and Health; 1997. Mounce K. Back pain. Rheumatology (Oxford) 2002;41:1-5. Cilliers L. Attitudes, knowledge and treatment of low back pain amongst nurses in the Eastern Cape, South Africa. Afr J Prim Health Care Fam Med 2013;5:535. Maul I, Läubli T, Klipstein A, Krueger H. Course of low back pain among nurses: A longitudinal study across eight years. Occup Environ Med 2003;60:497-503. June KJ, Cho SH. Low back pain and work-related factors among nurses in intensive care units. J Clin Nurs 2011;20:479-87. National Institute of Arthritis and Musculoskeletal and Skin Diseases. Handout on Health: Back Pain; 2004. Available from: http://www.niams.nih.gov/index.htm. [Last accessed on 2006 Mar 12; 14:15]. Buchbinder R, Jolley D, Wyatt M. Breaking the back of back pain. Med J Aust 2001;175:456-7. Croft PR, Papageorgiou AC, Thomas E, Macfarlane GJ, Silman AJ. Short-term physical risk factors for new episodes of low back pain. Prospective evidence from the South Manchester Back Pain Study. Spine (Phila Pa 1976) 1999;24:1556-61. Abdi Nejad F, Imam MJ, Azadi M. Low back pain and its relation to various jobs in men. SUMS 2001;1:39-47. Eriksen W, Bruusgaard D, Knardahl S. Work factors as predictors of intense or disabling low back pain; A prospective study of nurses' aides. Occup Environ Med 2004;61:398-404. Sopajareeya C, Viwatwongkasem C, Lapvongwatana P, Hong O, Kalampakorn S. Prevalence and risk factors of low back pain among nurses in a Thai public hospital. J Med Assoc Thai 2009;92 Suppl 7:S93-9. Engkvist IL, Hagberg M, Hjelm EW, Menckel E, Ekenvall L. The accident process preceding overexertion back injuries in nursing personnel. PROSA study group. Scand J Work Environ Health 1998;24:367-75. Smedley J, Poole J, Waclawski E, Stevens A, Harrison J, Buckle P, et al. Assessing investment in manual handling risk controls: A scoring system for use in observational studies. Occup Environ Med 2005;62:63-5. Jellema P, van Tulder MW, van Poppel MN, Nachemson AL, Bouter LM. Lumbar supports for prevention and treatment of low back pain: A systematic review within the framework of the Cochrane Back Review Group. Spine (Phila Pa 1976) 2001;26:377-86. Bhatnagar MK, Kostuik JP, Michael MS, Tooke T, Huckell C. Spinal Fusion and Rehabilitation after Care; 2002. Available from: http://www. Simmonsorthopaedic and spineassociates. [Last accessed on 2006 Mar 03; 10:25].